War = Good News for South Korea? South Korea was in the midst of figuring out what to do with its appreciating Won when disaster struck, in the form of an unprovoked attack from North Korea. Combined with a worsening of the sovereign debt crisis in Europe, the news was enough to send the Won down 5% over the course of a couple weeks. From the standpoint of managing its currency, it looks like the (distant) prospect of war is actually a blessing in disguise. 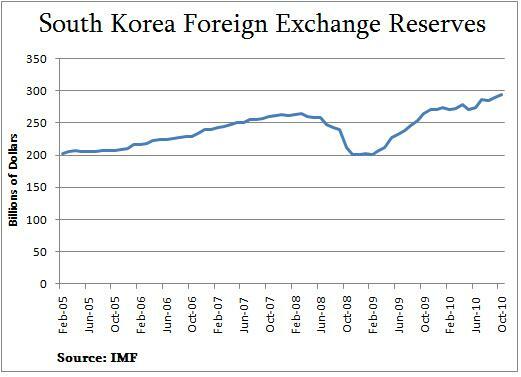 Over the last decade, South Korea has been one of the world’s largest serial interveners in currency markets. Over the last two years alone, as evidenced by the growth in its foreign exchange reserves, it has spent more than $100 Billion defending the Won. As the so-called currency war has intensified, so, too has the Bank of Korea intensified its efforts to hold down the Won, having spent more than $20 Billion since July towards this effort. You could say then that South Korea’s hosting of the G20 Summit on November 15 put it in a slightly awkward position. Still, it was determined to make clear that it would continue to take steps to combat the rise in the Won. According to Shin Hyun-song, the special economic advisor to President Lee Myung-bak, “This means that countries can intervene in the currency market when the market is in disorder and when there is a gap between the market rate and underlying economic fundamentals.” Of course, fundamentals is hardly an objective notion in this case. While the G20 predictably called on participants to “move toward a market-driven exchange rate system and to refrain from competitive devaluations,” it nonetheless also guided them towards “implementing policy tools for bringing excessive external imbalances down to sustainable levels.” The underlying message is that certain countries should curtail their reliance on exports and try to achieve more balanced growth. Even before this episode, the EU sovereign debt crisis had spread to Ireland, and put Spain and Portugal at risk, too. As a result, the Dollar-as-safe-haven mindset re-emerged, and spurred some capital movement back to the US. In this context, the drama with North Korea only exacerbated the climate of risk aversion. Ultimately, both the EU fiscal crisis and the tensions with North Korea will subside, which should cause the Won to resume its rise. (In fact, Korean exporters have come to view this as inevitable, and have taken advantage of the relatively favorable exchange rate to repatriate overseas earnings). At this point, you can expect the Bank of Korea to begin implementing capital controls and continue the face-off with currency markets. Today, we bring you an interview with Kathy Lien, the internationally published author, Director of Currency Research of FX360.com and GFT, and co-author of BKForex Advisor, one of the few investment advisory letters focusing strictly on the FX market. She is one of the authors of Investopedia’s Forex Education section and has written for Tradingmarkets.com, the Asia Times Online, Stocks & Commodities Magazine, MarketWatch, ActiveTrader Magazine, Currency Trader, Futures Magazine and SFO. Below, Kathy shares her thoughts on fundamental analysis versus technical analysis, rate hikes in China, forex intervention, and other subjects. Emerging market economies must be whining about their currencies for a good reason. Why else would they spend billions intervening in forex markets and risk provoking a global trade war? 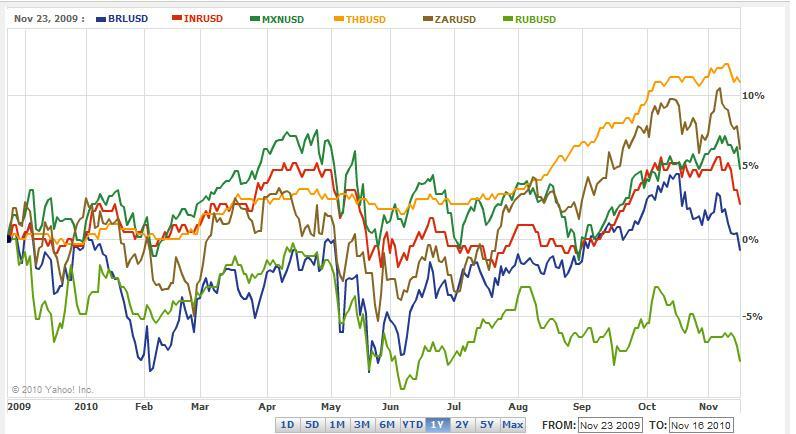 As it turns out, however, the rise in emerging market currencies has been greatly exaggerated. Over the last twelve months, the Brazilian Real is flat against the Dollar. The Korean Won has risen a mere 2%. The Indian Rupee has risen 4%, the Mexican Peso has appreciated 5%, and the standout of emerging markets – the Thai Baht – has notched a solid 10%. 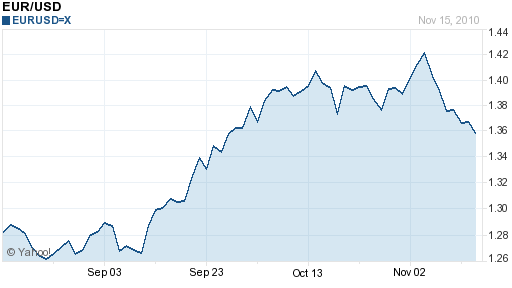 Impressive, but hardly enough to raise eyebrows, and barely keeping pace with the S&P 500. Not to mention that if you measure their returns against stronger currencies (i.e. not the Dollar) or on a trade-weighted basis, the performance of emerging market currencies in 2010 was actually pretty mediocre. Stock prices (proxied by the MSCI Emerging Markets Index) and bond prices (proxied by the JP Morgan EMBI+ Index) are still rising. Moreover, as emerging market Central Banks (continue to) hike interest rates, returns on investment (and consequently, the attraction to investors) will rise further. In fact, if credit default swap spreads are any indication, the risk of default is perceived as being lowest in emerging market economies. That means that investors are being compensated for taking less risk with greater returns! It doesn’t hurt that – as Fed Chairman Ben Bernanke recently pointed out – investors are buoyed bu the belief that emerging market currencies will continue appreciating, providing an addition boost to returns. It doesn’t look like the capital controls and other measures being adopted by emerging market economies will have a significant impact on slowing the inflow of foreign capital. Investors are already devising products to thwart the controls. So-called Global Bonds, for example, allow foreign investors to buy emerging market bonds without having to pay any special taxes, because they are settled in the home currency of the investor. Besides, investors with a long-term horizon can take solace that such taxes will become insignificant when allocated over a number of years. There are, however, reasons to be cautious, In the short-term, bad news and flare-ups in risk aversion invariably hit emerging market assets hardest. Regardless of what information can be gleaned from credit default spreads, the majority of investors still associate the US with safety and emerging markets with volatility. That’s why when news of Ireland’s financial troubles broke, emerging market currencies fell across the board, and the Dollar rallied. In addition, rising interest rates could cause bond prices to fall, and stock-market valuations may not be supported by fundamentals: “Emerging markets on average recorded economic growth of about 4 percent over the past few years while companies only recorded profit growth half of that. In China over the past decade economic growth was about 10 percent, while company earnings growth was only about 2 percent.” There is also evidence that investors and companies from emerging market countries are taking advantage of their strong currencies to invest and buy abroad, reversing the flow of capital. Personally, I am slightly bullish with regard to emerging market currencies. The figures I quoted at the beginning of this post make it clear that we are not yet in bubble territory. In addition, even if fundamentals in emerging markets are not quite as strong as foreign investors would like to believe, they are certainly a lot stronger than in industrialized economies. Regardless of if/when the currency war is resolved, the short-term prospects for emerging market currencies remain bright. In my last post, I explored the possibility that the role of the Chinese Yuan (CNY) will expand to the point that it could rival – or even overtake – the US Dollar as the world’s preeminent reserve currency. Ultimately, I concluded that the constraints on widespread foreign ownership of CNY assets are too great, and that as a result, the Dollar’s position is safe for the time being. What about the notion that all currencies are doomed? In this case, the biggest threat to the US Dollar won’t come from China, but rather from gold. This possibility is no longer hypothetical. James Grant (of the eponymous Grant’s Interest Rate Observer) has for many years tried to advance the case for a return to the Gold Standard. In a much-discussed editorial in the NY Times, Grant reiterated the idea that Central Banker are increasingly out of touch with economic reality, and lack any checks on their ability to print money and debase their respective currencies. Grant singles out the Fed for its non-stop quantitative easing programs, which could lead to hyper-inflation and foment additional asset bubbles. At the very least, it will cause the Dollar to lose even more of its value. Grant’s editorial coincided perfectly (perhaps deliberately) with a proposal by Robert Zoellick, president of the World Bank, to reform the global economic system, with the goal of reducing economic imbalances. While most of Zoellick’s ideas are common-sense, his proposal to “build a co-operative monetary system that reflects emerging economic conditions.” and “consider employing gold as an international reference point of…currency values” stood out. While his comments created a veritable firestorm, they were grounded firmly in the reality that gold prices are rising and faith in the current fiat monetary system is declining. The theoretical advantages and disadvantages of the gold standard have been mooted ad nauseum, and I don’t want to rehash all of them here. In sum, a gold standard is believed to be promote long-term price stability, eliminate hyper-inflation, a check on government debt issuance, and a transfer monetary power from Central Banks to the people (via the markets). Downsides include short-term price volatility, a heightened possibility of deflation, and the repudiation of modern monetary policy. Given the fact that paper currency in circulation vastly exceeds the supply of gold, a transition to the gold standard would be difficult to implement and would probably cause a substantial rise in the price of gold. Personally, I’m not convinced that a return to the gold standard would promote economic/financial stability any more than the fiat money system. For example, just as large financial institutions dominate the current system, so they would be likely to dominate any other system, leading to the same lack of transparency and democracy. In addition, gold can also be lent out (with interest), leading to a similar propensity for asset bubbles and economic imbalances of every kind. Just like currencies have relative value today (in terms of other currencies, commodities, assets, labor, etc. ), so does gold. In that sense, saying seven units of gold is enough to buy a house is not really that different from saying it costs 10 units of paper currency to buy that same house. For instance, if Chinese producers charge 1 gold coin for their widgets while American producers charge 2, it will still result in a trade imbalance that will only correct when the Chinese standard of living catches up to the US standard of living. Finally, gold is arbitrary. Why not a platinum standard or an oil standard? Based on the scarcity of those resources, prices would vary accordingly, much as they do under the paper currency system. Not to mention that gold is incredibly unwieldy, which means that it would be digitalized and used electronically just like paper currencies. You could argue that this is actually a benefit of the gold standard, since it would be compatible with the current economic system, but at least it would lead to financial stability. Maybe I’m in denial like Ben Bernanke, but I just don’t see gold as the solution. Asset bubbles inflate, and then they collapse. Economic imbalances will persist for as long as they are allowed to. If emerging market exporters get tired of receiving Dollars for their wares, then they will stop accepting it, the Dollar’s value will crash, and the US economy will have to rebalance itself. In a perfect world, there would be no irrational exuberance. In reality, the current system will persist, and life will go on. Chinese Yuan Will Not Be Reserve Currency? In a recent editorial reprinted in The Business Insider (Here’s Why The Yuan Will Never Be The World’s Reserve Currency), China expert Michael Pettis argued forcefully against the notion that the Chinese Yuan will be ever be a global reserve currency on par with the US Dollar. By his own admission, Pettis seeks to counter the claim that China’s rise is inevitable. The core of Pettis’s argument is that it is arithmetically unlikely – if not impossible – that the Chinese Yuan will become a reserve currency in the next few decades. He explains that in order for this to happen, China would have to either run a large and continuous current account deficit, or foreign capital inflows into China would have to be matched by Chinese capital outflows.” Why is this the case? Simply, a reserve currency must necessarily offer (foreign) institutions ample opportunity to accumulate it. For this to change, foreigners would need to have both a reason and the opportunity to hold RMB assets. 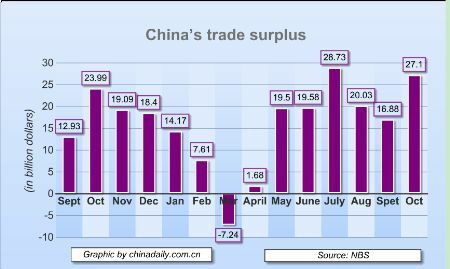 The reason would come from a reversal in China’s balance of trade, and the use of RMB to pay for the excess of imports over exports, which would naturally imply a willingness of foreign entities to accept RMB. The opportunity would come in the form of deeper capital markets, a complete liberalization of the exchange rate regime (full-convertibility of the RMB), and the elimination of laws which dictate how foreigners can invest/lend in China. This would likewise an imply a Chinese government desire for greater foreign ownership. How likely is this to happen? According to Pettis, not very. 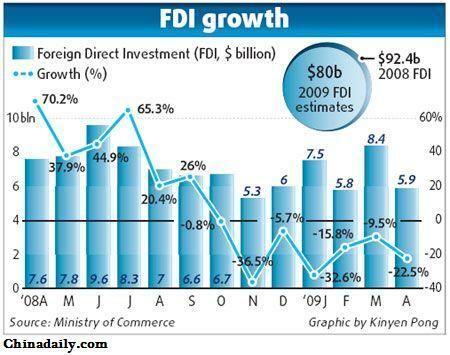 China’s financial/economic policy are designed both to favor the export sector and to promote access to cheap capital. In practice, this means that interest rates must remain low, and that there is little impetus behind the expansion of domestic consumption. Given that this has been the case for almost 30 years now, this could prove almost impossible to change. For the sake of comparison, consider that despite two “lost decades,” Japan nonetheless continues to promote its export sector and maintains interest rates near 0%. So there you have it. The political/economic/financial structure of China is such that it would be arithmetically very difficult to increase foreign accumulation of RMB assets to the extent that the RMB would be a contender for THE global reserve currency. For this to change, China would have to embrace the kind of reforms that go way beyond allowing the RMB to fluctuate, and strike at the very core of the CCP’s stranglehold on power in China. If that’s what it will take for the RMB to become a fully international currency, well, then it’s probably too early to be having this conversation. Perhaps that’s why the Asian Development Bank, in a recent paper, argued in favor of modest RMB growth: “sharing from about 3% to 12% of international reserves by 2035.” This is certainly a far cry from the “10 years” declared by Russia’s finance minister and tacitly supported by Chinese economic policymakers. The implications for the US Dollar are clear. While it’s possible that a handful of emerging currencies (Brazilian Real, Indian Rupee, Russian Ruble, etc.) will join the ranks of the international currencies, none will have enough force to significantly disrupt the status quo. When you also take into account the economic stagnation in Japan and the UK, as well as the political/fiscal problems in the EU, it’s more clear than ever that the Dollar’s share of global reserves in one (or two or three) decades will probably be only slightly diminished from its current share. You can think of this as a follow-up to my last post, entitled “Euro Due for a Correction,” in which I proclaimed that “investors got ahead of themselves when they pushed the Euro down 20% over the first half of 2010, but now they are in danger of making the same mistake, and are pushing the Euro too far in the opposite direction.” Since then, the Euro has indeed fallen 4%. In this case, however, I’m reluctant to toot my own horn, since there were other forces at work. Namely, he sovereign debt crisis has officially spread beyond Greece, and “Contagion is definitely back on the table.” Of chief concern is Ireland, whose banking sector is in serious financial turmoil: “Irish banking losses are estimated at up to 80 billion euros ($109 billion), depending on the forecast used, or 50 percent of the economy. As long as housing prices continue to fall, these losses cannot be capped.” At this point, it’s unlikely that the banks can remain afloat without (additional) government help. The only problem is that the government has already raided its welfare fund, and it is projected that additional support would leave a gaping hole in the budget, equivalent to 32% in GDP. Allowing the banks to fail, meanwhile, would lead to economic losses of 50% of GDP. Currently, their governments insist that they can get by without help from the European Commission. To be fair, they have managed both to issue new debt and refinance existing debt without serious difficulty. In addition, Ireland and Portugal have modest reserve funds which could tide them over for close to a year, if need be. The medium-term, however, looks less rosy. If rising bond yields are any indication, these countries could be in serious trouble. 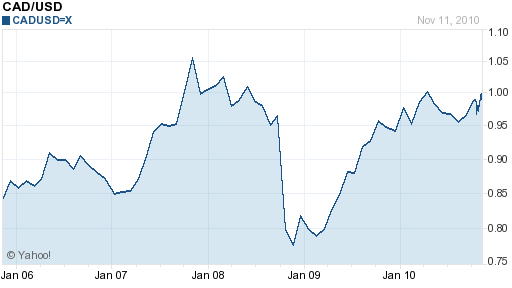 Bond investors are not concerned about an EU bailout, which is seen as inevitable, at least for Ireland. After all, the European Financial Stability Facility that was created in May still has more than $500 Billion left in it. Rather, investors are concerned that they will be asked to take part in the bailout. Germany, for example, is toughening its stance towards fiscally strained countries, and Angela Merkel has insisted that, “Highly indebted eurozone countries struggling to repay will be forced to restructure their debt in a process of ‘managed insolvency’ and that their creditors will need to take large ‘haircuts.’ ” Up until now, the EU has intimated that will provide a backstop against sovereign default, in order to assuage bond market investors. This is changing, as German and French politicians insist that they are more beholden to their constituents/taxpayers than they are to their debt-ridden EU brethren. Given that Germany is fiscally sound, it has pretty much nothing to lose (short of a breakup of the Euro) by playing hardball. 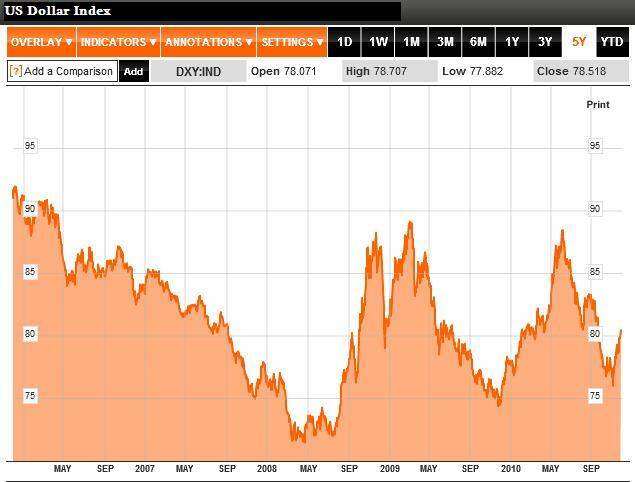 In fact, it may actually benefit from scaring away investors, since a weaker Euro will strengthen its export sector. Today, we bring you an interview with Mike Hewitt of Dollar Daze, whose “belief is that the paper currencies of the world are presently undergoing a devaluation.” Below, Mr. Hewitt shares his thoughts on the US Dollar, Chinese Yuan, inflation, and why you should be paying attention to Gold and other commodities. Last week, the Canadian Dollar became the second currency – after the Australian Dollar – to reach parity against the US Dollar. While the case for Loonie parity is not quite as strong as the Aussie’s, there is nonetheless reason to believe that it will continue trading at this level for the short-term. It’s not hard to understand what’s driving the Loonie; the weak Dollar. As the Fed embarks on further monetary easing (QE2), investors are nervous that all of these new Dollars will be deployed in a speculative – rather than productive capacity. Emerging market currencies are particularly popular, with commodity currencies, such as the Canadian Dollar, not far behind. According to Bank of Canada Governor Mark Carney, “The outlook for the Canadian dollar… ultimately reflects the economic fundamentals.” While he has threatened to intervene if currency markets are “disrupted” (i.e. if the Loonie rises to an unreasonable level), past history and the tone of Carney’s remarks suggests that the Bank of Canada will remain on the sidelines for the duration of the currency war. From where I’m sitting, the Canadian Dollar (as with the New Zealand Dollar, the subject of my previous post), don’t deserve to benefit from the speculative wall of money that is flowing out of the US. The Canadian economy is projected to grow by only 1% in 2010, and after adjusting for the contraction in 2009, it is still the same size as it two years ago. Not to mention that the Canadian government issued a record amount of debt to shepherd the economy through the recession. Most worrying is that Canada’s trade deficit is nearing a record high, and on an annualized basis is now approaching $30 Billion a year. In addition, anecdotal stories suggest that Canadians are engaging in cross-border shopping and traveling abroad in great numbers to take advantage of relatively cheap prices. With the Canadian Dollar now at parity, these phen0omena are already becoming entrenched: “We would not anticipate much of an improvement in these trade patterns in the next couple of quarters,” said one economist. The second observation is that currency markets are self-correcting, and that is especially true in the case of the Canada. As the Loonie rises, Canadian exports become less competitive, and consumers (sometimes physically!) start importing more. At some point then, the Loonie will reverse its decline, and the trade deficit will shrink. However, if you drill deeper into the numbers, you can see that Canada is running a sizable trade surplus with the US. That means that the Canadian Dollar probably has room to rise further (or the Dollar has room to fall further), before the bilateral trade deficit would even close to narrowing. On a trade-weighted basis (perhaps against the Euro), the Loonie has few sources of fundamental support. For what it’s worth, analysts from CIBC World Markets seem to agree: they see the Loonie declining more than 5% over the next six months as the uproar over QE2 gradually fades, and the data shows that only a modicum of the newly printed US Dollars found their way into Canada. Despite reaching a temporary stalemate, the currency war rages on, and individual countries continue to debate whether they should enter or watch their currencies continue to appreciate. Nowhere is that debate stronger than in New Zealand, whose Kiwi currency has fallen 37% against the US Dollar since its peak in early 2009, and over 15% since June of this year. With most countries, the war cries are coming from the political establishment, who feel compelled to demonstrate to their constituents that they are diligently monitoring the currency war. This is largely the case in New Zealand, as Members of Parliament have argued forcefully in favor of intervention. Prime Minister John Key is a little more pragmatic: He “says his Government is concerned about the strength of our dollar, but is not convinced intervention would work…politicians who think intervention can happen without economic consequences, are fooling themselves.” Showing an astute understanding of economics, he pointed out that trying to limit the Kiwi’s appreciation would manifest itself in the form of higher inflation, higher interest rates, and/or reduced access to capital. This is essentially the position of Alan Bollard, Governor of the Central Bank of New Zealand. He has insisted (correctly) that the New Zealand is being driven up, so much as its currency counterparts – namely the US Dollar – are being driven downward, by forces completely disconnected from New Zealand and way beyond its control. Thus, if New Zealand tried to intervene, it would quickly be overpowered (perhaps deliberately!) by speculators. Ultimately, it would end up spending lots of money in vain, and the Kiwi would continue to appreciate. Mr. Bollard has pointed out that a stronger currency is not without its perks: such as lower (relative) prices for certain natural resources, such as oil. In addition, since New Zealand is largely a commodity economy, its producers are being compensated for an expensive currency in the form of higher prices for milk, wool, and other staple exports. While its other manufacturing operations have been punished by the expensive Kiwi, its economy is still relatively robust. Thanks to a series of tax cuts and the lowest interest rates in New Zealand history, GDP is forecast to return to trend in 2010 and 2011. New Zealand’s concerns are understandable, and there is an argument to be made for preventing the Dollars that are printed from the Fed’s QE2 from being put to unproductive purposes in New Zealand. At the same time, New Zealand is not such an attractive target for speculators. Its benchmark interest rate, at 3%, is relatively low compared to developing countries. 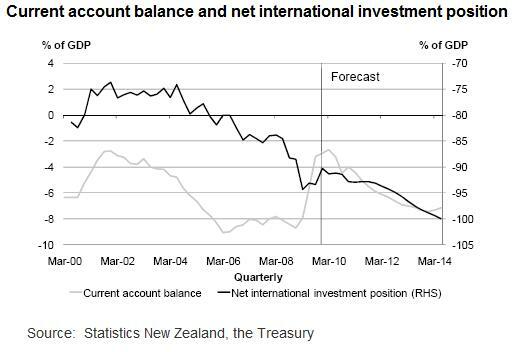 Its current account balance is projected to continue declining, perhaps down to -8%, which means that the net flow of capital is actually out of New Zealand. In addition, while the Kiwi has appreciated against the US Dollar, it has fallen mightily against the Australian Dollar en route to a multi-year low. Going forward, there is reason to believe that the New Zealand Dollar will continue to appreciate against the US Dollar as a result of QE2 and a general sense of pessimism towards the US. The same is true with regard to currencies that actively intervene to prevent their currencies from appreciating. Still, I don’t think the New Zealand Dollar will reach parity – against any currency – anytime soon, and after the currency fracas subsides, it will probably trend towards its long-term average. The “currency war” is heating up, and all parties are pinning their hopes on the G20 summit in South Korea. However, this is reason to believe that the meeting will fail to achieve anything in this regard, and that the cycle of “Beggar-thy-Neighbor” currency devaluations will continue. There have been a handful of developments since the my last analysis of the currency war. First of all, more Central Banks (and hence, more currencies) are now affected. In the last week, Argentina pledged to continue its interventions into 2011, while Taiwan, and India – among other less prominent countries – have hinted towards imminent involvement. As the war reaches a climax of sorts, everyone is waiting with baited breath to see what will come out of the G20 Summit. Unfortunately, the G20 failed to achieve anything substantive at last month’s Meeting of Finance Ministers and Central Bank Governors, and there is little reason to believe that this month’s meeting will be any different. In addition, the G20 is not a rule-making body like the WTO or IMF, and it has no intrinsic authority to stop participating nations from devaluing their currencies. Conference host South Korea has lamely pointed out that while ” ‘There aren’t any legal obligations‘…discussion among G20 countries would produce ‘a peer-pressure kind of effect on these countries’ that violated the deal.” Not to mention that the G20 will have no effect on the weak Dollar nor on the undervalued RMB, both of which are at the root of the currency war. It’s really just wishful thinking that countries will come to their senses and realize that currency devaluation is self-defeating. In the end, the only thing that will stop them from intervening is to accept the futility of it: “The history of capital controls is that they don’t work in controlling foreign exchange rates.” This time around will prove to be no different, “particularly with banks already said to be offering derivatives products to get around the new taxes.” The only exception is China, which is only able to prevent the rise of the RMB because of strict controls for dealing with the inflow of capital. In short, the “wall of money” that is pouring into emerging market economies represents a force too great to be countered by individual Central Banks. The returns offered by investing in emerging markets (even ignoring currency appreciation) are so much greater than in industrialized countries that investors will not be deterred and will only work harder to find ways around them. Ironically, to the extent that controls limit the supply of capital and boost returns, they will probably drive additional capital inflows. The more successful they are, the more they will fail. And that’s something that no new currency agreement can change. For the last few months, and especially over the last few weeks, the financial markets have been obsessed with the rumored expansion of the Fed’s Quantitative Easing program (“QE2”). With the prospect of another $1 Trillion in newly minted money hitting the markets, investors presumptively piled into stocks, commodities, and other high-risk assets, and simultaneously sold the US Dollar in favor of higher-yielding alternatives. 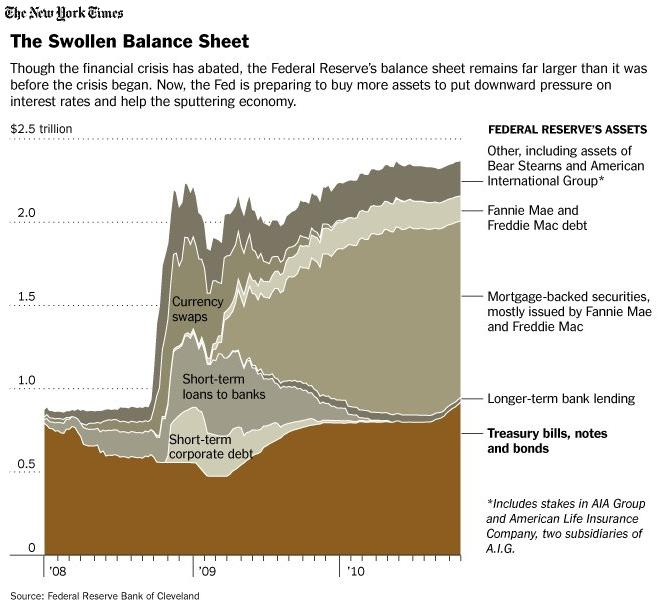 On Wednesday, rumor became reality, as the Fed announced that it would expand its balance sheet by $600 Billion through purchases of long-dated Treasury securities over the next six months. While the announcement (and the accompanying holding of the Federal Funds Rate at 0%) were certainly expected, markets were slightly taken aback by its scope. Due to conflicting testimony by members of the Fed’s Board of Governors, investors had scaled back their expectations of QE2 to perhaps $300-500 Billion. To be sure, a handful of bulls forecast as much as $1-1.5 Trillion in new money would be printed. The majority of analysts, however, New York Fed chief William Dudley’s words at face value when he warned, “I would put very little weight on what is priced into the market.” It was also rumored that the US Treasury Department was working behind the scenes to limit the size of QE2. Thus, when the news broke, traders instantly sent the Dollar down against the Euro, back below the $1.40 mark. On the one hand, the (currency) markets can take a step back and focus instead on other issues. For example, yields on Eurozone debt have been rising recently due to continued concerns about the possibility of default, but this is not at all reflected in forex markets. During the frenzy surrounding QE2, the forex markets also completely neglected comparative growth fundamentals, which if priced into currencies, would seem to favor a rally in the Dollar. 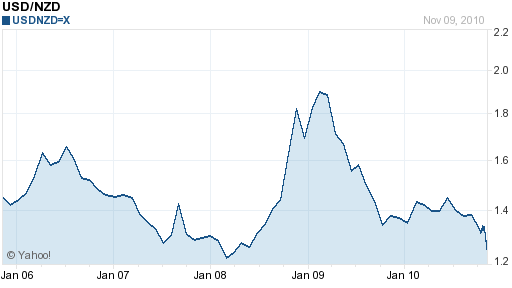 On the other hand, I have a feeling that investors will continue to dwell on QE2. While the consensus among analysts is that it will have little impact on the economy, they must nonetheless await confirmation/negation of this belief over the next 6-12 months. In addition, all of the speculation to date over the size of QE2 has been just that – speculation. Going forward, speculators must also take reality into account, depending on how that $600 Billion is invested and the consequent impact on US inflation. If a significant proportion of is simply pumped into domestic and emerging market stocks, then the markets will have been proved right, and the Dollar will probably fall further. If, instead, a large portion of the funds are lent and invested domestically, and end up buoying consumption, then some speculators will be forced to cover their bets, and the Dollar could rally. Unfortunately, while QE2 is largely seen as a win-win for US stocks (either it stimulates the economy and stocks rally, or it fails to stimulate the economy but some of the funds are used to foment a stock market rally anyway), the same cannot be said for the US Dollar. 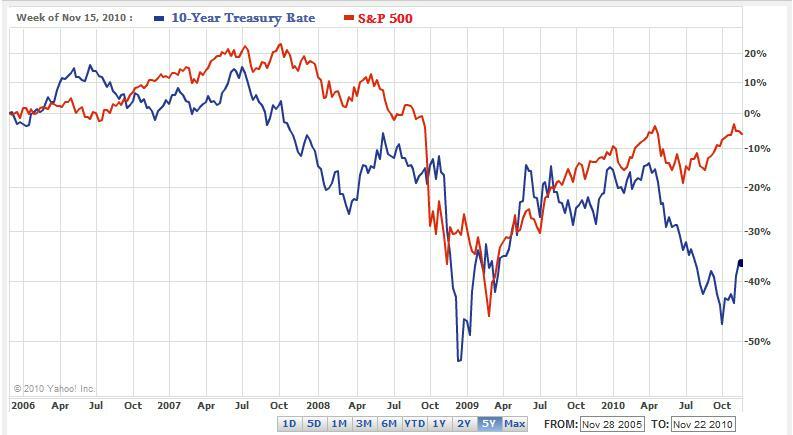 If QE2 is successful, then hawks will start moaning about inflation and use it as an excuse to sell the Dollar. If QE2 fails, well, then the US economy could become mired in an interminable recession, and bears will sell the Dollar in favor of emerging market currencies. Currency Wars: Will Everyone Please Stop Whining! I read a provocative piece the other day by Michael Hudson (“Why the U.S. Has Launched a New Financial World War — and How the Rest of the World Will Fight Back“), in which he argued that the ongoing currency wars are the fault of the US. Below, I’ll explain why he’s both right and wrong, and why he (and everyone else) should shut up and stop complaining. It has become almost cliche to argue that the US, as the world’s lone hegemonic power, is also the world’s military bully. Hudson takes this argument one step further by accusing the US of using the Dollar as a basis for conducting “financial warfare.” Basically, the US Federal Reserve Bank’s Quantitative Easing and related monetary expansion programs create massive amounts of currency, the majority of which are exported to emerging market countries in the form of loans and investments. This puts upward pressure on their currencies, and rewards foreign speculators at the expense of domestic exporters. Hudson is right that the majority of newly printed money has indeed been shifted to emerging markets, where the best returns and greatest potential for appreciation lies. Simply, the current economic and investing climate in the US is not as strong as in emerging markets. Indeed, this is why the (first) Quantitative Easing (QE) program was not very successful, and why the Fed has proposed a second round. While there is a bit of a chicken-and-egg conundrum (does economic growth drive investing, or do investors drive economic growth?) here, current capital flow trends suggest that any additional quantitative easing will also be felt primarily in emerging markets, rather than in the US. 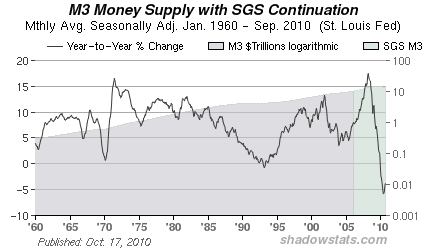 Not to mention that the US money supply has expanded at the same pace (or even slower) as the US economy over the long-term. While the point about QE being ineffective is well-taken, Hudson completely ignores the strong case to be made for investing in emerging markets. He dismissively refers to all such investing as “extractive, not productive,” without bothering to contemplate why investors have instinctively started to prefer emerging markets to industrialized markets. As I said, emerging market economies are individually and collectively more robust, with faster growth and lower-debt than their industrialized counterparts. Calling such investing predatory represents a lack of understanding of the forces behind it. 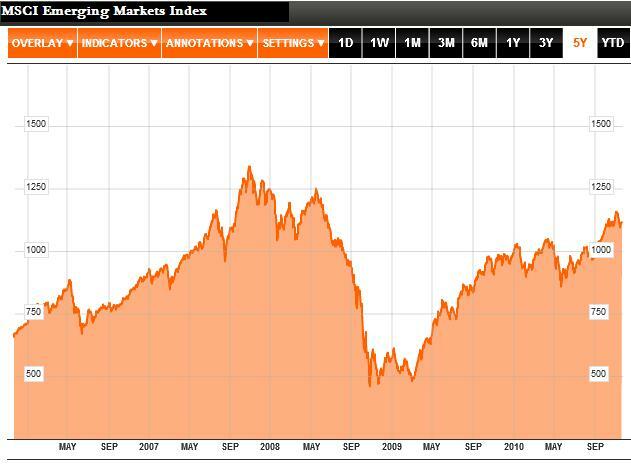 Hudson also overlooks the role that emerging markets play in this system. The fact that speculative capital continues to pour into emerging markets despite the 30% currency appreciation that has already taken place and the asset bubbles that may be forming in their financial markets suggests that their assets and currencies are still undervalued. That’s not to say that the markets are perfect (the financial crisis proved the contrary), but rather that speculators believe that there is still money to be made. On the other side of the table, those that exchange emerging market currency for Dollars (and Euros and Pounds and Yen) must necessarily accept the exchange rate they are offered. In other words, the exchange rate is reasonable because it is palatable to all parties. You can argue that this system unfairly penalizes emerging market countries, whose economies are dependent on the export sector to drive growth. What this really proves, however, is that these economies actually have no comparative advantage in the production and export of whatever goods they happen to be producing and exporting. If they can offer more than low costs and loose laws, then their export sectors will thrive in spite of currency appreciation. Look at Germany and Japan: both economies have recorded near-continuous trade surpluses for many decades in spite of the rising Euro and Yen. The problem is that everyone benefits (in the short term) from the fundamental misalignments in currency markets. Traders like to mock purchasing power parity, but over the long-term, this is what drives exchange rates. Adjusting for taxes, laws, and other peculiarities which distinguish one economy from another, prices in countries at comparable stages of development should converge over the long-term. You can see from The Economist’s Big Mac Index that this is largely the case. As emerging market economies develop, their prices will gradually rise both absolutely (due to inflation) and relatively (when measured against other currencies). Ultimately, the global economy (of which currency markets and exchange rates represent only one part) always operates in equilibrium. 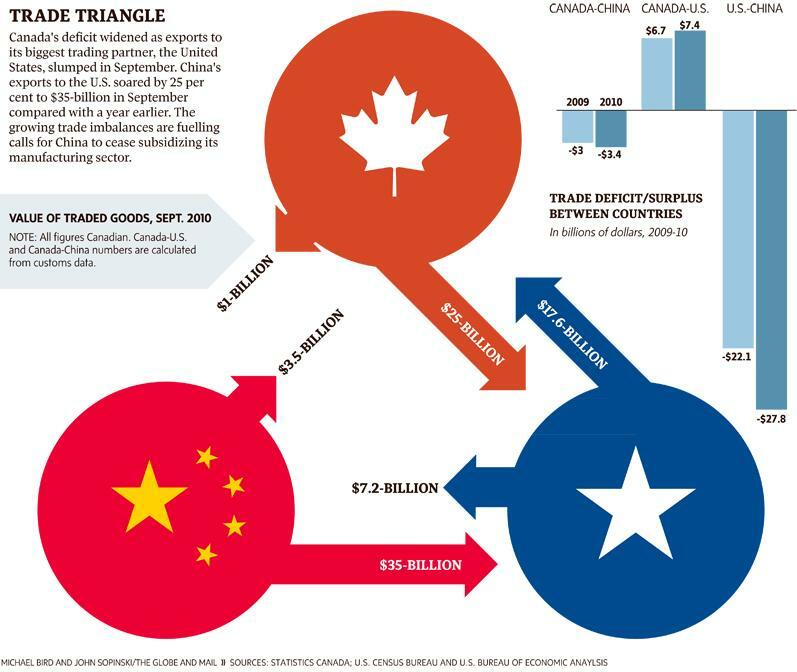 The US imports goods from China, which sterilizes the inflows in order to avoid RMB appreciation by building up a stash of US Dollars, and holding them in US Treasury Bonds. Of course, everything would be easier if China allowed the RMB to appreciate AND the US government stopped running budget deficits, but neither side is willing to make such a change. In reality, the two will probably happen simultaneously: China will gradually let the RMB rise, which will cause US interest rates to rise, which will make it more expensive and less palatable to add $1 Trillion to the National Debt every year, and will simultaneously make it more attractive to produce in the US. Until then, politicians from every country and hack economists with their napkin drawings will continue to whine about injustice and impending economic doom.